Summer is here at last, so it's time to don some ripped jeans, an old t-shirt, a straw trilby and get stuck into the garden. Grass needs cutting, hedges need trimming. flowers need watering, and weeds need pulverising. Luckily for you, we've got the tech to make all of those tasks easier. Whether it's robotic lawnmowers, gardening clothes, or apps to log plants, We've got it call. You can thank us when you're relaxing in your very own Garden of Eden. Mowing the lawn is a hassle, especially if you have little time or a big garden (or both). The Flymo 1200 R is an automatic lawnmower that, thanks to clever technology, can cut your lawn everyday without any fuss. 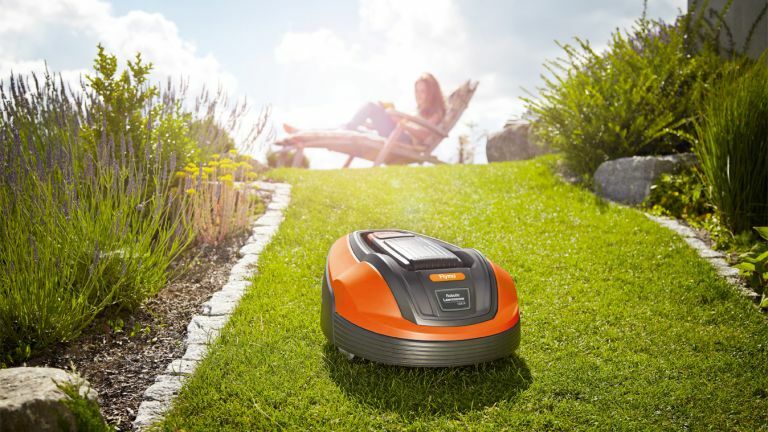 Flymo has thought about what is important when it comes to cutting the lawn and the 1200 R makes no noise (thanks to its electric motors) and cuts in an irregular pattern, to make sure that one section doesn't get cut more than another. The mower comes with an alarm and security pin (so it can't be stolen) and works on any garden, regardless of shape or size. A true multitasker. Some ask why, other ask why not. What else can you say about this amazing gardening contraption from Batavia other than that it looks like a serious piece of kit. And serious it is, offering a super handy three-fold application set of weeder, hot air gun and BBQ lighter. Got lots of weeds in your garden? Simple, click on weed killer mode and obliterate them with heat alone in just 5 seconds. Need to strip paint? Time for hot air gun mode. Want to stuff yourself with tasty BBQ? Well get the old barby up and running in no time at all with the in-built lighter unit. Don't think a piece of tech that doesn't use chemicals or produce a flame can get that hot? Think again, as the Bavaria heat tool has three settings that stretch up from 50°C to a whopping 600°C. Hot, hot, hot. A lot like this product. Unless you have an in-door garden, spending time among the shrubs and busses can be wet—especially with Britain's unpredictable weather. Having a decent waterproof is useful (if not essential) and can make the days much, much better. The Patagonia Torrentshell (available for both men and women) is a low-cost, but effective jacket that can project you from bad weather. The hood is designed to keep water—or snow or sleet or hail—out of your face and there are a number of options for different conditions. Cutting grass is an intensive job and the Bosch Rotak 34 R Electric Rotary Lawn Mower will make it easier, thanks to its powerful motor—which, Bosch says, is ideal for wet grass—smaller size, and adjustable lever height. The 34 R also comes with one of the most useful features a lawnmower can have: The ability to cut the edges of the grass, meaning the annoying process of trimming is no longer required. According to Bosch, the 34 R is also easy to transport as it folds down to a storage height of 55cm and weighs 11kg. GardenTags is a free app for the iPhone that is, essentially, Instagram for gardeners. A user gets a profile, the option to upload photos, and the ability to talk to other gardeners. According to the founders, GardenTags is like “a mixture of Instagram and Wikipedia” and is a useful tool for anyone who wants to improve their garden. The app is broken down into several sections, such as the main feed, the user's profile, and a to-do list. The app can also identify plants from a photo which, for anyone who has ever spent time leafing through a plant encyclopaedia, is a useful feature. Home security is important and having a camera—and perhaps associated motion-triggered lights—in the garden can help keep ill-intentioned people away. The Samsung SDC-7440 is a well-equipped dome-shaped camera that can record outdoors come rain or shine. Thanks to infrared, the camera can “see” up to eight meters at night, capturing the tiniest of details. Image capture is, according to Samsung, well above the industry average. The cheaper price tag—£69.99 for one unit—means that multiple SDC-7440s can be bought for the price of some other units, creating a better area of coverage outside. Keeping foxes, cats, squirrels and other wildlife away from precious plants is important and the Rentokil FC78 Cat and Fox Deterrent does just that. According to Rentokil, the FC78 works in all weather conditions, has a range of 10 meters, and issues a sound that is not detectable by the adult human ears. While some deterrents use poison, the FC78 doesn't, making it a more humane way to keep wildlife out of your vegetable patch. Some animals can take a few weeks to learn what the sound means, however. Keeping the garden watered is not a concern in the winter—in Britain, at least—but can be in the summer. Having a good sprinkler, like the Hozelock Vortex Sprinkler 2520, can solve this problem. With an innovative design, the 2520 can cover a large area quickly, distributing water evenly so that ever patch of ground gets the nutrients it needs. Unlike other sprinklers, the 2520 has a round design (rather than a bar), meaning it can cover a larger area. Water conservation is important, especially during summer, and the 2520 makes sure that none gets wasted, thanks to its design. A good strimmer is essential for keeping bushes and other vegetation clean and tidy. The Contour 650E electric grass trimmer from Flymo makes it easy to do this by providing a lightweight but powerful appliance that will make short-work of any lawn and shrubbery. In 'Shrubbing' mode the trimmer can be adjusted to a horizontal position to make life easier, while the 650E's telescopic shaft and handle allow quick changes in height too. Throw in a retractable plant guard, twin automatic feed cutting system and long 10-metre power cable, and its easy to see why the Flymo Contour 650E Electric Grass Trimmer is an excellent bit of gardening kit. Kärcher is a well-known German brand that stands for quality and its pressure washer—called the K2—is no exception. With a powerful motor, the K2 will let you jet down anything with the option to add soap (or other detergents) in its tank. The different versions, such as the “car,” have different tools included to deal with the different surfaces. The washer even comes with a two year warranty.